Another group is being recognized as our WARRIORS this week, students. Yes, students going back to school, students going to college for the first time, students who face the pressure and anxiety of succeeding in a new environment with new teachers, new expectations, and new realities. This should be a time of hope, future possibilities, and fun! I remember when I went to college a “few” years back and even though I was so excited, I remember also being terribly freaked out. For me, and this may be way too much information for you, but my anxiety kept me in the bathroom for long amounts of time. So much so that my mom took me to the health clinic. Not the first place on campus you want to visit opening week, but alas that’s where I found myself. I soon realized I had to pull it together, or else. Not everyone has the ability to make that choice so easily. 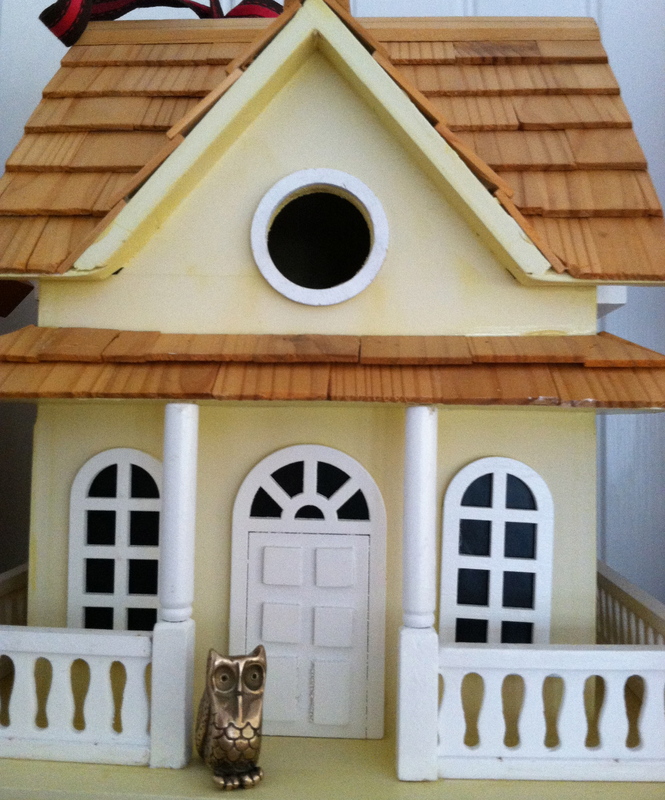 I just read a story about a young woman who jumped off the roof of her dormitory on the first night she started college. Tragic. This is not uncommon and the statistic on the homepage of The Jed Foundation reads that one in ten college students has considered suicide. The foundation was formed as a response to the high levels of anxiety and depression found among college aged people. Ok, that’s enough heaviness! Time to applaud all the student WARRIORS who are making their way to the battlegrounds of their futures! With a totem in hand and a class schedule that lets you sleep in most mornings, you are on your way!! 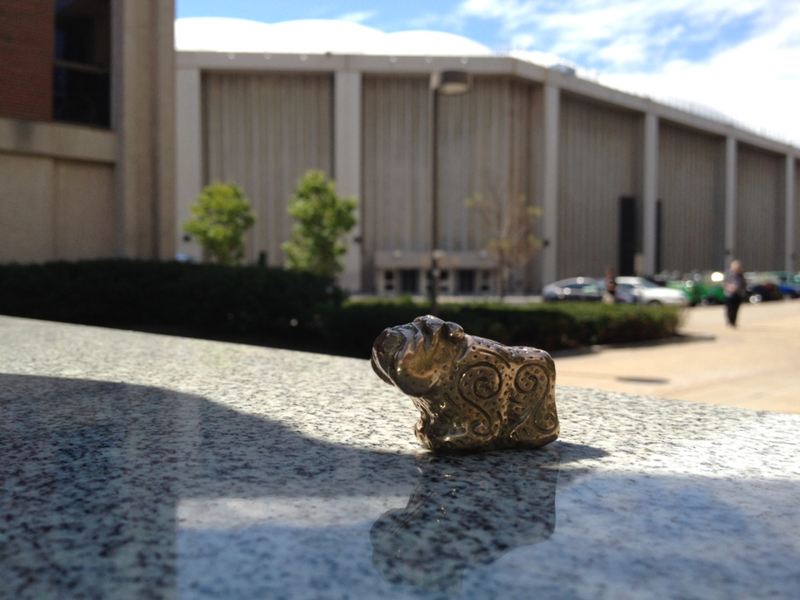 Thanks to Jackson a student at Syracuse University for sending a picture of his Bulldog Totem with the Carrier Dome as a backdrop! You are a WARRIOR, indeed! I came across this scene the other day and it stopped me in my tracks. 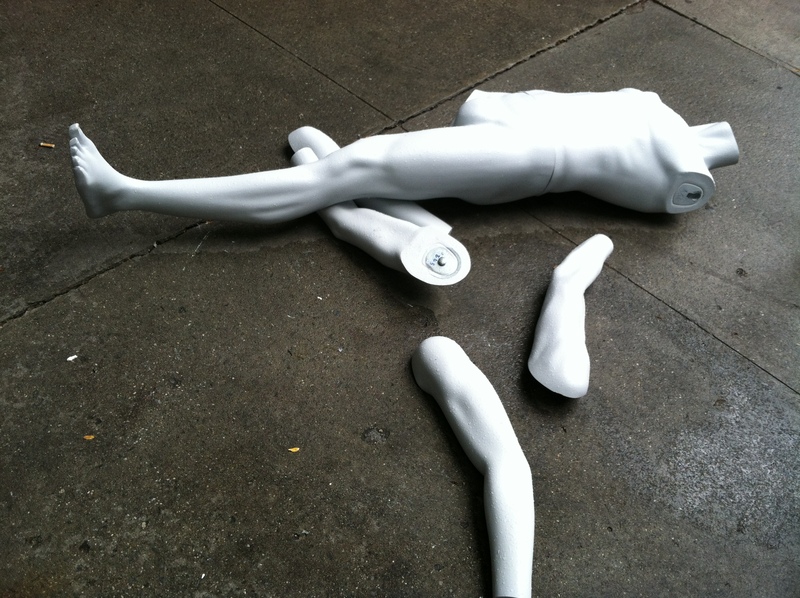 It was surreal to see the body parts littered carelessly on the sidewalk and so many people passing by without a notice. This image made me sad initially because even though it’s not a real person, there are many people walking the streets of this world who may feel just like the mannequin. We all do at some point or another, feel like our lives are falling apart, or we’ve lost our head, or we don’t know if we have the strength to put it all back together. The amazing reality is that we all have the parts and sometimes though they do scatter and we feel helpless and alone, we have the pieces to become whole again. Some of us are able to fall apart and come back together seamlessly, and yet others need an extra hand (pun intended.) My hope for Totem Tamers is that when you start to think you may fall apart, that you grab your totem and use your power to reassure yourself that even if you do fall apart, you will be able to put yourself back together. So although the image made me sad initially, now I see it filled with hope, and I hope you see it too. Totem Tamers presents WARRIOR WEDNESDAYS! Totem Tamers would like to honor a group of WARRIORS today who don’t get much recognition but who deserve our utmost respect and admiration, Caregivers. Studies have shown that Caregivers are at an increased risk for depression, stress, and psychological illnesses. Female caregivers are particularly at risk according to a recent study of those caring for people suffering with Alzheimer’s Disease. For all Caregivers, Totem Tamers applauds you and hopes that you can take some time for yourself today and everyday to refocus, and redirect all your stresses and receive positive energy back. Grab a Totem, a quiet space, and take some deep cleansing breaths, you deserve it! Hear the sounds of the ocean as you breathe deep and exhale your stress. Totem around Town! 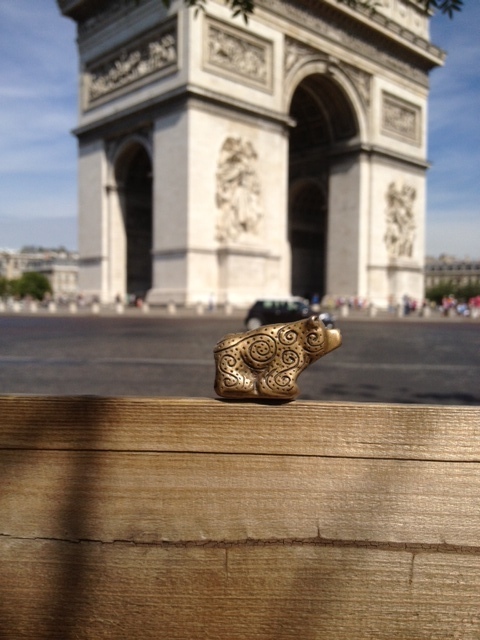 Bear is in Paris! Our esteemed WARRIOR this week is none other than The Boss! 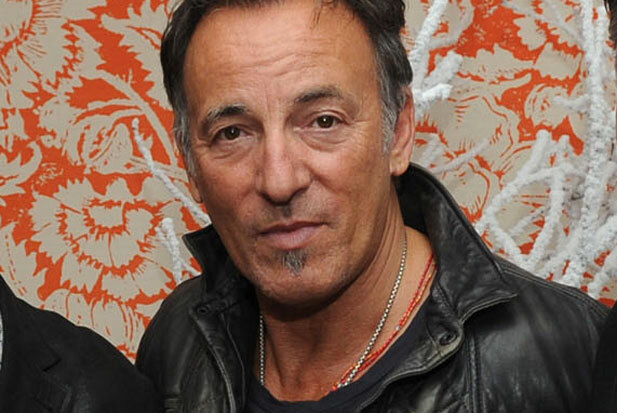 Yes, that boss, BRUUUUUUUUUCE Springsteen! Anytime someone opens up about their struggles with mental illness they automatically become a WARRIOR. It is even more impacting when a rock star who’s image is associated with freedom, sexiness, and cool comes out and openly and honestly discusses his suicidal tendencies, growing up in a house with mental illness and being in therapy for years. Thank you Bruce for letting the world know that you can have these feelings and still rock! Onward and upward! The Boss has feelings too! Our warrior this week is the accomplished and lovely Tara McNamara! Tara is the founder of the site kidspickflicks.com as well as a writer, radio and tv host to name just a few of her other skills. 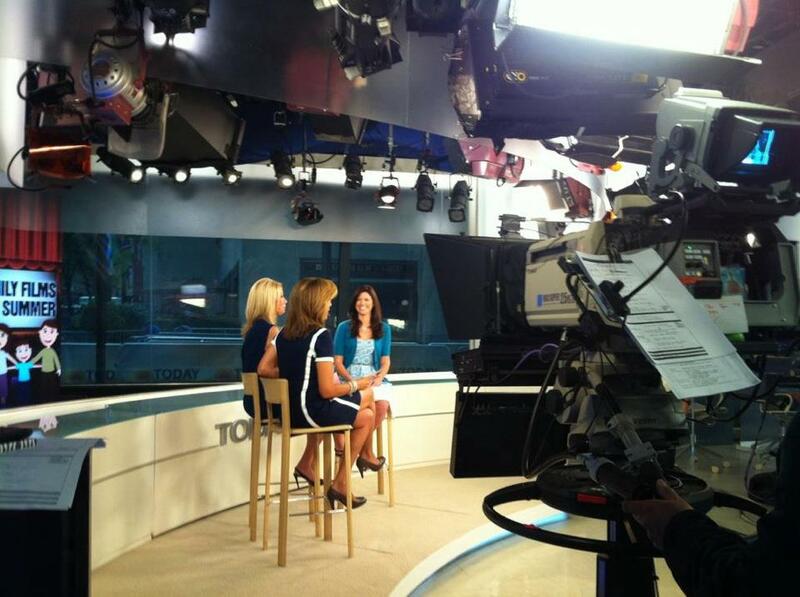 Recently, Tara was asked to join Kathie Lee and Hoda on the fourth hour of The Today Show! Tara had no idea that she would find herself so nervous as she has done countless celebrity interviews and tv appearances, but alas the anxiety crept in. Tara McNamara on Today with Totem in hand! Tara and Totem in action! 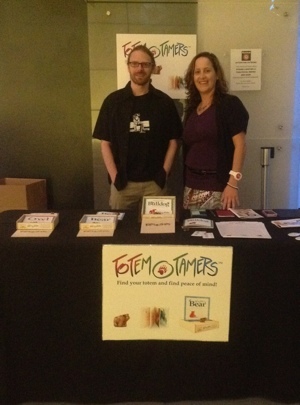 Thank you Tara for letting Totem Tamers be a part of this incredible experience and for sharing your story! That’s why you are this weeks WARRIOR! Totem Tamer thought for the day! 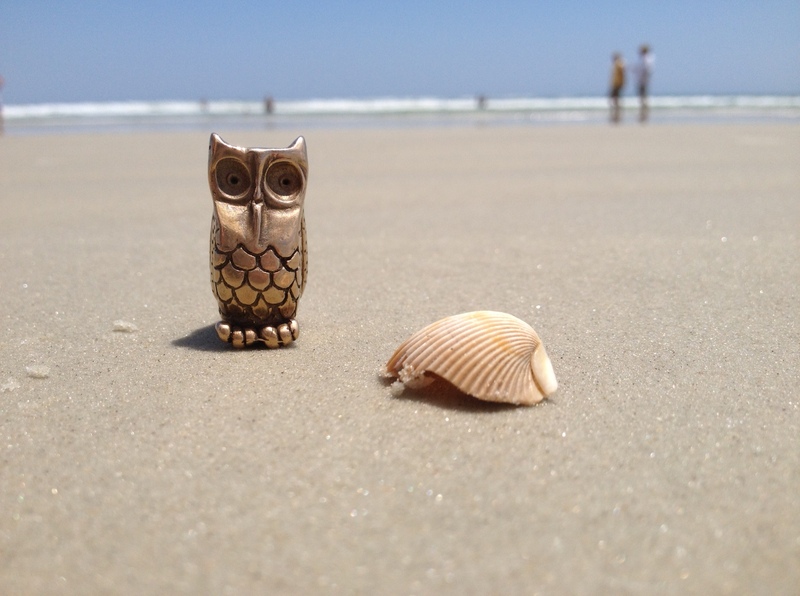 Grab a totem and begin something new today! A little self-serving today, but everyone needs a pat on the back once in a while, right? So today’s WARRIOR’s are none other than my partner Daniel and I! Why? Because we’re awesome, that’s why! Seriously, Totem Tamers attended a great event last night in support of Long Island Bulldog Rescue and it was a lot of work and a whole lot of fun. We met some really great people who were very excited to meet Bulldog and learn how Totem Tamers can help almost anyone achieve greater calmness in their lives. We talked to tons and stayed on our feet pretty much the whole night, and that alone makes us WARRIOR’s! There is nothing more satisfying than watching the expressions on people’s faces when they hold a totem for the first time. There was the young lady who has six rescue dogs who squealed with delight when she held Bulldog. Then there was the gentleman who stood about 6’6 and covered head to toe in tattoos who exclaimed how “Bee-yoo-tee-full” the totems were, he was fantastic! There were many others of course and all were touched in some way or another. It was moving to both Daniel and I to say the least. Thank you to everyone who stopped by and we will see you at another event soon!